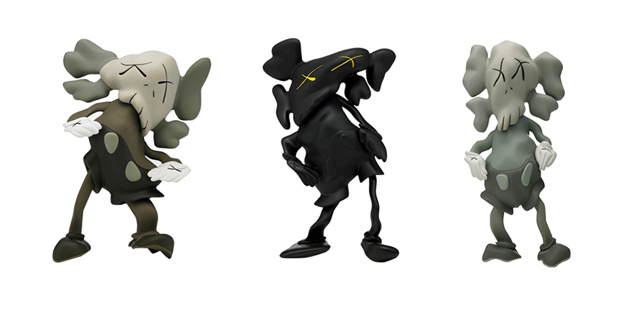 The latest version of KAWS' companion figure, 'Resting Place's makes its way to the UK this weekend and will go on sale in very limited numbers. It's set to be a busy few of weeks for UK brand AnyForty as they open their first physical store at Boxpark and release a new collection celebrating 5 years in the business. Kidrobot have announced that their Covent Garden store will close at the end of this month after more than 3 years in London. As part of a series of special 10 year anniversary releases, Kidrobot will shortly release this golden version of their 8 Inch Dunny to kick off the celebrations. Japan's Neighborhood are next to work on Medicom Toy's iconic Bearbrick, opting for a simple matte black take on the piece, with a slight twist at the ears. Matt JOnes, otherwise known as Lunartik, has produced a new 'super infused' range of his cup of tea figure, in 7 colour options. Medicom Toy continue their work with Walt Disney and produce another vinyl re-working of Mickey Mouse, this time realised as Pirates of the Caribbean's Jack Sparrow. The 2011 edition of the All Gone book, which documents street culture in hardback form on a yearly basis, is due for release in a very short time. Medicom's Be@rbrick series returns for it's 22nd run of blind-boxed figures, and as always there's plenty for collectors to get excited about. Japanese toy manufacturers Medicom use Johnny Depp's Mad Hatter as inspiration for this flip on Disney's Micky Mouse, finally available in the UK. This Thursday will see the release of a brand new 3" Dunny set from the Kidrobot camp. The 2011 Series features 20 individual Dunny designs, by 15 different artists, including Chuck Boy, Huck Gee, and Dirty Donny. Just before the weekend, Amos Toys kicked off their Miniature Plastic Workshop in London with a private opening on Thursday evening. Following it's stint in Japan, Amos bring their Miniature Plastic Workshop to London's KK Outlet this week, which will encompass a gallery, toy exhibition and pop-up shop. The latest Bearbrick release is this special edition by the guys at Alife, a double pack including both 400% and 100% Bearbricks in an allover, grey fade flock.